Driver shortage still ranks number one among motor carriers thanks to today’s intense freight demand. Professional drivers are enjoying better pay and benefits as fleets try to attract and retain loyal and skilled drivers. 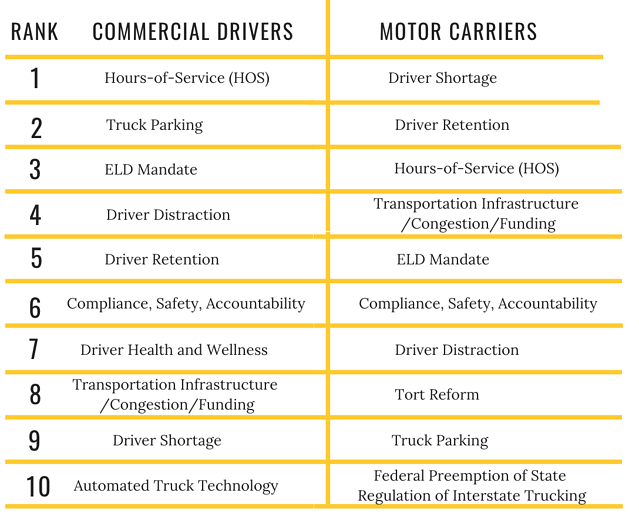 In the drivers’ situation, the shortage of drivers creates work for the currently employed, thus elevating the need for more flexibility in the hours-of-service rules, which is the number one driver issue. In 2016, the ELD mandate was the number one overall issue in the ATRI’s survey and it also ranked number two in 2017. With the ELD mandate now in place, the issue has dropped as attention has notably shifted to other pressing issues. Remarkably, though, out of the 26 issues presented in the 2018 ATRI survey, drivers and fleets shared eight of their respective top 10 picks, though with variation in their rankings. This level of driver and carrier agreement is a good thing for the trucking industry. In any work situation, labor and management must first settle on the issues to be addressed and, we must admit, we were very happy to read that the ATRI survey showed such a large percentage of agreement across a wide range of pressing issues. The next question to address, however, is how to approach these issues. The ATRI asked respondents to offer their preferred steps to address each issue and found that, for the larger labor and management issues, Congress and regulatory agencies will obviously have to be involved. And, while these will be more challenging issues to solve, as long as drivers and motor carriers act together, the whole industry is in a better position to achieve success.